Still farther along the waterfront from the two palaces we've just seen, this is the city's most exuberant building. 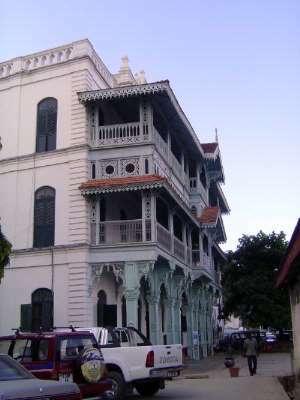 Conceived as a hospital by an Ismaili businessman on the occasion of Victoria's 1887 Jubilee, it became instead the Ismaili Khoja Dispensary, with upstairs apartments. Badly deteriorated, the building was leased in 1990 to Aga Khan Cultural Services, which restored the building and now occupies part of the premises; the rest is rented by several other businesses.